Chairman of the Techint Group; President and Founder of Humanitas Research Hospital and Humanitas University. 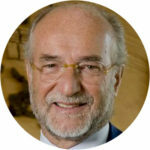 From 2013 to 2017 President of Assolombarda, and from 2004 to 2012 VP for Education of Confindustria. Member of the BoD of Allianz, Brembo, Buzzi Unicem, Bocconi and LUISS University, and also member of the BoD of Museo Nazionale Scienza e Tecnologia Leonardo Da Vinci and AB member of Politecnico of Milan. He joins also the Allianz SE and the Harvard Business School AB, the Aspen Institute Executive Committee, the BIDMC’s Cancer Center Executive Board, the Trilateral Commission and the European Round Table of Industrialists. Cavaliere del Lavoro (2007), Leonardo Prize (2009).